The Celtic Tree Calendar is a calendar with thirteen lunar divisions. Most contemporary Pagans use fixed dates for each "month," rather than following the waxing and waning lunar cycle. If this was done, eventually the calendar would fall out of sync with the Gregorian year, because some calendar years have 12 full moons and others have 13. The modern tree calendar is based on a concept that letters in the ancient Celtic Ogham alphabet corresponded to a tree. Although you don't have to follow a Celtic path to celebrate the Celtic tree calendar months, you'll find that each of the themes in the Celtic tree months ties strongly to Celtic culture and mythology. "The lunar tree calendar of the Celts has long been a source of controversy among Celtic scholars. Some even claim it was never a part of the old Celtic world, but was an invention of author/researcher Robert Graves. The Druids are generally given credit by other researchers for creating this system. 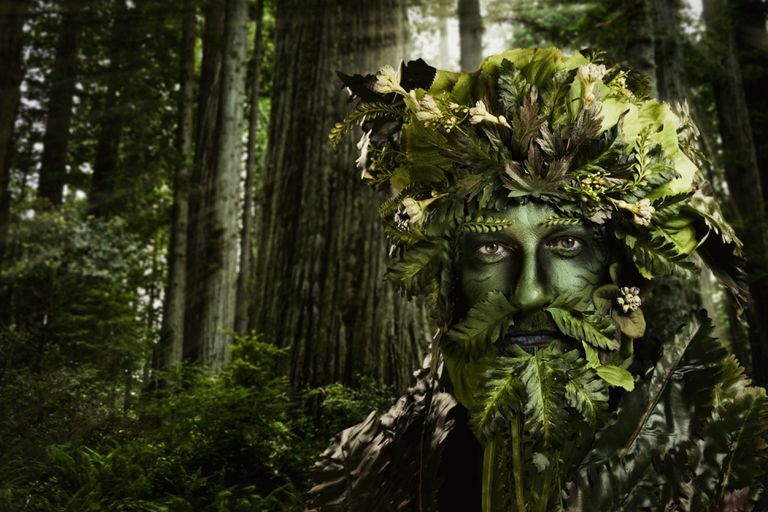 There seems to be no scholarly evidence to prove otherwise, yet many Celtic Pagans feel that the system pre-dates the time of Druidic influence over Celtic religious matters. It is probably reasonable to believe that the truth lies somewhere in between these three extremes. It is most likely that the tree system was in place, with minor regional variations before the time of the Druids who experimented with it, discovered the magical properties of each tree, and codified all the information into the system we have today." The Birch Moon is a time of rebirth and regeneration. As the Solstice passes, it is time to look towards the light once more. When a forested area burns, Birch is the first tree to grow back. The Celtic name for this month is Beth, pronounced beh. Workings done in this month add momentum and a bit of extra "oomph" to new endeavors. The Birch is also associated with magic done for creativity and fertility, as well as healing and protection. Tie a red ribbon around the trunk of a Birch tree to ward off negative energy. Hang Birch twigs over a cradle to protect a newborn from psychic harm. Use Birch bark as magical parchment to keep writings safe. The Rowan Moon is associated with Brighid, the Celtic goddess of hearth and home. Honored on February 1, at Imbolc, Brighid is a fire goddess who offers protection to mothers and families, as well as watching over the hearthfires. This is a good time of year to perform initiations (or, if you're not part of a group, do a self-dedication). Known by the Celts as Luis (pronounced loush), the Rowan is associated with astral travel, personal power, and success. A charm carved into a bit of a Rowan twig will protect the wearer from harm. The Norsemen were known to have used Rowan branches as rune staves of protection. In some countries, Rowan is planted in graveyards to prevent the dead from lingering around too long. The ash is associated with prophetic dreams and spiritual journeys. In the Norse eddas, Yggdrasil, the world tree, was an Ash. The spear of Odin was made from the branch of this tree, which is also known by the Celtic name Nion, pronounced knee-un. This is one of three trees sacred to the Druids (Ash, Oak and Thorn), and this is a good month to do magic that focuses on the inner self. Associated with ocean rituals, magical potency, prophetic dreams and spiritual journeys, the Ash can be used for making magical (and mundane) tools -- these are said to be more productive than tools made from other wood. If you place Ash berries in a cradle, it protects the child from being taken away as a changeling by mischievous Fae. At the time of the Spring Equinox, or Ostara, the Alder is flourishing on riverbanks, roots in the water, bridging that magical space between both heaven and earth. The Alder month, called Fearn by the Celts, and pronounced fairin, is a time for making spiritual decisions, magic relating to prophecy and divination, and getting in touch with your own intuitive processes and abilities. Alder flowers and twigs are known as charms to be used in Faerie magic. Whistles were once made out of Alder shoots to call upon Air spirits, so it's an ideal wood for making a pipe or flute if you're musically inclined. The Willow moon was known to the Celts as Saille, pronounced Sahl-yeh. The Willow grows best when there's lots of rain, and in northern Europe there's no shortage of that this time of year. This is a tree associated with healing and growth, for obvious reasons. A Willow planted near your home will help ward away danger, particularly the type that stems from natural disaster such as flooding or storms. They offer protection, and are often found planted near cemeteries. This month, work on rituals involving healing, growth of knowledge, nurturing and women's mysteries. The Hawthorn is a prickly sort of plant with beautiful blossoms. Called Huath by the ancient Celts, and pronounced Hoh-uh, the Hawthorn month is a time of fertility, masculine energy, and fire. Coming right on the heels of Beltane, this month is a time when male potency is high — if you're hoping to conceive a child, get busy this month! The Hawthorn has a raw, phallic sort of energy about it — use it for magic related to masculine power, business decisions, making professional connections. The Hawthorn is also associated with the realm of Faerie, and when the Hawthorn grows in tandem with an Ash and Oak, it is said to attract the Fae. The oak tree has long been venerated by people of many cultures as a symbol of strength and power. The Oak moon falls during a time when the trees are beginning to reach their full blooming stages. The mighty Oak is strong, powerful, and typically towering over all of its neighbors. The Oak King rules over the summer months, and this tree was sacred to the Druids. The Celts called this month Duir, which some scholars believe to mean "door", the root word of "Druid." The Oak is connected with spells for protection and strength, fertility, money and success, and good fortune. Carry an acorn in your pocket when you go to an interview or business meeting; it will be bring you good luck. If you catch a falling Oak leaf before it hits the ground, you'll stay healthy the following year. Although the Oak ruled in the previous month, its counterpart, the Holly, takes over in July. This evergreen plant reminds us all year long about the immortality of nature. The Holly moon was called Tinne, pronounced chihnn-uh, by the Celts, who knew the potent Holly was a symbol of masculine energy and firmness. The ancients used the wood of the Holly in the construction of weapons, but also in protective magic. Hang a sprig of Holly in your house to ensure good luck and safety to your family. Wear as a charm, or make Holly Water by soaking leaves overnight in spring water under a full moon — then use the water as a blessing to sprinkle on people or around the house for protection and cleansing. The Hazel Moon was known to the Celts as Coll, which translates to "the life force inside you." This is the time of year when Hazelnuts are appearing on the trees, and are an early part of the harvest. Hazelnuts are also associated with wisdom and protection. Hazel is often associated in Celtic lore with sacred wells and magical springs containing the salmon of knowledge. This is a good month to do workings related to wisdom and knowledge, dowsing and divination, and dream journeys. If you're a creative type, such as an artist, writer, or musician, this is a good month to get your muse back, and find inspiration for your talents. Even if you normally don't do so, write a poem or song this month. The Vine month is a time of great harvest — from the grapes of the Mediterranean to the fruits of the northern regions, the Vine produces fruits we can use to make that most wondrous concoction called wine. The Celts called this month Muin. The Vine is a symbol of both happiness and wrath — passionate emotions, both of them. Do magical workings this month connected to the Autumn Equinox, or Mabon, and celebrate garden magic, joy and exhilaration, wrath and rage, and the darker aspect of the mother goddess. Use the leaves of the Vines to enhance your own ambition and goals. during this month. The month of Vine is also a good time to get balanced, as there are equal hours of darkness and light. As the year comes to a close and Samhain approaches, the Ivy moon rolls in at the end of the harvest season. Ivy often lives on after its host plant has died — a reminder to us that life goes on, in the endless cycle of life, death and rebirth. The Celts called this month Gort, pronounced go-ert. This is a time to banish the negative from your life. Do workings related to improving yourself, and placing a barricade between you and the things that are toxic to you. Ivy can be used in magic performed for healing, protection, cooperation, and to bind lovers together. Reed is typically used to make wind instruments, and this time of year, its haunting sounds are sometimes heard when the souls of the dead are being summoned to the Underworld. The Reed Moon was called Negetal, pronounced nyettle by the Celts, and is sometimes referred to as the Elm Moon by modern Pagans. This is a time for divination and scrying. If you're going to have a seance, this is a good month to do it. This month, do magical workings related to spirit guides, energy work, meditation, celebration of death, and honoring the cycle of life and rebirth. The winter solstice has passed, and the Elder moon is a time of endings. Although the Elder can be damaged easily, it recovers quickly and springs back to life, corresponding to the approaching New Year. Called Ruish by the Celts (pronounced roo-esh), the month of Elder is a good time for workings related to creativity and renewal. It is a time of beginnings and endings, births and deaths, and rejuvenation. Elder is also said to protect against demons and other negative entities. Use in magic connected to Faeries and other nature spirits.